Dayton, Ohio - The coaching staff for the Alumni Team in the Dayton Dragons 20th Season Celebration Game was announced today. The list includes a four-man coaching staff, all of whom played for the Dragons or previously coached for the Dragons. The manager of the Alumni team will be Jose Nieves, who served as the Dragons manager for three seasons from 2013-15. Nieves has served as the manager of the Reds Arizona League affiliate near his hometown in Goodyear since his final season with the Dragons and will continue in that role in 2019. Donald Lutz, who produced one of the top seasons in Dragons history in 2011, will be the hitting coach for the Alumni team on March 30. 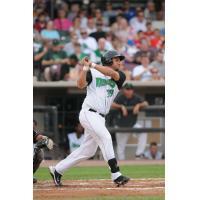 Lutz's 2011 year with the Dragons makes him one of only two Dayton players ever to complete a season with a batting average of at least .300 while hitting at least 20 home runs (Austin Kearns is the other). He is also the only player in Dragons history to hit for the cycle in a game (single, double, triple, and home run in the same game). Lutz served as a coach on Nieves' staff in Goodyear in 2018 and will return there in 2019. He completed his playing career in 2017. Lutz played in 63 games for the Reds and became the first player raised in Germany to reach the Major Leagues. Luis Montano, a key starting pitcher with the 2008 Dragons playoff team, will serve as the Alumni team's pitching coach. Montano led the Dragons in victories in 2018, going 12-8 with a team that included Todd Frazier, Zack Cozart, and Devin Mesoraco. Montano has served as the pitching coach for the last eight seasons for the Reds Dominican Summer League affiliate. Frank Pfister will serve as the bench coach for the Alumni team. Pfister played in 199 games as a member of the Dragons to rank in the top-10 in franchise history. His best season came in 2010 when he batted .266 with 26 doubles, eight home runs, and 50 runs batted in. Pfister will return in 2019 for his fourth season as the Reds Minor League mental skills coach, a new position created when Pfister was hired in 2015. As previously announced, former Dragons players Austin Kearns, Todd Coffey, and Chris Dickerson, and former Dragons coaches Ken Griffey Sr., and Tom Browning are expected to appear at the Celebration Game. Dragons 2017 star outfielder Jose Siri has been added to the list of players expected to play for the Alumni team. Siri produced one of the best seasons in Dragons history in 2017 when he finished first or second in the Midwest League in eight major offensive categories (including home runs, slugging percentage, extra base hits, runs, hits, and stolen bases), was selected as the league's best defensive outfielder, and compiled a league-record 39-game hitting streak. Among the list of other players expected to play for the Alumni team on March 30 at Fifth Third Field are former Dragons outfielders Taylor Trammell, TJ Friedl, Narciso Crook, and Stuart Fairchild; and infielders John Sansone and Brantley Bell. The Dragons will host their "20th Season Celebration Game" on Saturday, March 30 at 2:00 p.m. at Fifth Third Field. The game will match the 2019 Dragons ("Team 20") against a team of Dragons alumni who are still playing in the Cincinnati Reds minor league system. Individual game tickets for the Dragons 20th Season Celebration Game are available now. Go to daytondragons.com/celebrationgame or Ticketmaster.com.